We Can Invest in Our Schools and Lower Property Taxes. School district and healthcare taxes are the largest drivers of our rising property taxes. Despite sitting on a multi-billion dollar Rainy Day Fund, the state provides less funding for public schools than it did 14 years ago. Republicans have refused to expand Medicaid under the Affordable Care Act, leaving over $10 billion a year on the table. Tap the Rainy Day Fund and expand Medicaid and we can support our schools and improve healthcare while reducing the pressure on rising property taxes. Sign the petition to stop SB9 and protect your voting rights! Texas clearly does not spend enough per student. Your education shouldn’t be determined by where you’re born in our state or how much your parents’ property is worth-if they have any property at all. Read more. We need to talk about how we are spending resources; millions of dollars have been taken away from our women’s health care network and re-assigned to ideological groups with no oversight. This has created waste and an additional burden on public hospitals and emergency rooms. We must save money and reallocate. Read more. Bail bond reform is a top priority. It is completely unjust to jail people for being poor and it is fiscally irresponsible. The aims of any future reforms by our legislature should be focused on accountability for police, citizens, defendants, prisoners and the families of prisoners alike. Read more. Cities should be allowed to have open debate about raising the minimum wage and not fear overarching obstruction from those in Austin. Read more. Republican statewide leadership has attacked local control. SB4 is one of the most dishonorable and ineffective pieces of legislation that has passed through the chambers of our state legislature. Read more. 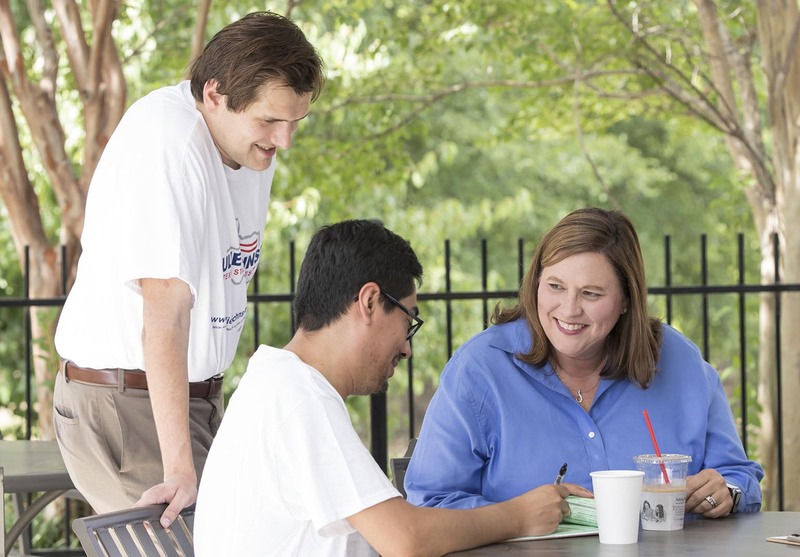 Julie believes all Texans have the right to a quality education, affordable healthcare, and economic opportunity. We’re counting on you to help send Julie to Austin so she can fight for those opportunities for every Texas family. Will you start by by making a contribution to her campaign for Texas House District 115 today? We need to reach as many people and voters as possible. It is essential to have a robust volunteer base to help turn out the vote. Will you volunteer your time? Connect your friends and neighbors online or at an event near you. This campaign is possible because of YOU. Join us today. Invite your friends and neighbors to help us get the word out.